My funemployment officially starts in September because I am still employed full-time as a graduate student through August. However, now that I am post-defense, I have the time to set myself up well to transition into funemployment. I’m going to attempt to document my funemployment through a series of goal posts. Just after the start of each month, I will report how I did on my goals for the month that just ended and set out goals for the month that is starting. I also would like to report my income during these months, but I’m still negotiating with Kyle on how exactly to do that (he is more private than I am). Today’s post will serve as laying out what I hope to be the structure of these posts and to delineate my first set of goals. These should be relatively self-explanatory. I don’t expect service work to make me any money, although it could be good networking or cross-promotion with my online projects. Career-advancing activities and online work may or may not earn some money, but that is not their primary purpose at the moment. I want to get my ideas for my online projects out into the world (new websites, ebooks) so that I’m not distracted by them once I start full-time work again. Likewise, career advancement may be paid or unpaid but I hope it will all be good job experiences and/or useful networking leading up to my full-time job search. There are plenty of other more personal goals like for friendships, our household, and my health, but these are the ones related to career and money that I’d like some accountability for here on EPF. I might set some concrete income goals in a month or two when I have some more certainty about my sources of income. Goal 1: Finish all (possible) PhD-related work. I don’t want to have any grad school stuff hanging over my head in September! I technically have until September 6 to turn in my edited dissertation, but I want all the is dotted and the ts crossed before the end of August. I need to clean out my bench and office and help the lab pack for its move mid-month. I also have to submit a paper so my goal is to have that done this month, although if my co-authors are a bit slow it might not happen in time. Goal 2: Apply for a freelance position. I have had it in mind to work for a certain company during or after my PhD on a contract basis that seems like a great fit for me. I never made the time for it during grad school (hello EPF!) but now I have the time and I’d like to bring in some money. Many of my friends from grad school have worked for this company as contractors and a couple currently work there full-time and I think it will be a good experience, though not terribly lucrative. Goal 3: Apply for a fellowship. I’ve had my eye on a sweet semester-long working fellowship in the DC area for the last 4-5 years but I didn’t want to pause my PhD to do it, especially since it only occurs during the school year. But this year would be great timing! The program starts in January 2015 and the deadline for applying is the end of August. It should be an amazing career-building experience if I’m able to do it. Goal 4: Contact partners concerning volunteering. In the past two years I have volunteered at my university and at my church in the area of personal finance. When I got into my crazy period of writing my dissertation and preparing for my defense, I let the people I was working with know that I was going to be unavailable for a few months but that I would be back full-force in the fall. Now I need to let them know that I’m willing to jump in again. Goal 5: Ramp EPF back up. I’ve missed posting on EPF so much during these last few months! I’m going to return to a regular posting schedule and keep an editorial calendar and all of that. However, I’m going to restructure my recurring posts and drop down to posting about twice per week to make room for my other writing projects. 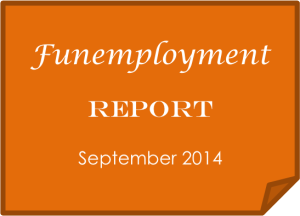 I want to have a regular presence on the blogosphere again in advance of FinCon14. Goal 6: Buy two new domains. I picked out two new URLs to buy last spring but didn’t pull the trigger because I knew I wouldn’t have time to work on the projects then. I’d like to secure them now so Kyle and I can start working on them. One is a sister site to the site we developed and only soft-launched last spring and the other is going to be an authority site. Goal 7: Explore local internship opportunities. I’ve already received a few leads in this area in the past few months that I need to follow up on. I’m not sure if I will ultimately do an internship but I certainly want to check out what’s possible this fall. I think this is enough to get started with! I think my goals for September will be more numerous/deeper as we really dig into these new projects and I find work. Wish me luck! What are you trying to accomplish this month? Do you use any productivity software that you really like? 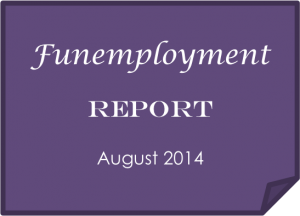 Would you report irregular income on a blog for accountability and motivation purposes? 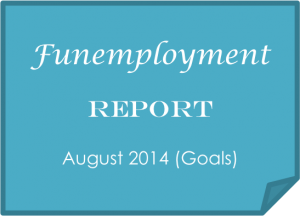 24 Responses to "Funemployment Report: Goals for August 2014"
Those are great goals! As I’ve said before, it’s great to have you back around these PF parts. Wrapping up everything you can as soon as possible is definitely a good place to start. I still have a paper lingering around that I’ve lost traction on and my PhD supervisor is sort of lazy about. That’s from over 1.5 years ago! Will it ever get published? I don’t know. So you’re just “bidding your time” so to speak (but with fulfilling opportunities by the sounds of it) until Kyle finds his postdoc? Is there any news on that front, or is he staying with his PhD lab for a bit longer? I have this one paper to submit this month, but I think that might be the last. I don’t think my results on my other projects are good enough to publish at this point, and there is no one to carry them on as of now. Yes, biding my time. I’m really happy for the break, actually, and for the chance to gain some non-academic job experience before I start my FT search. I’m planning to be in Durham through the end of December at least. No news for Kyle – just steady progress on his papers, and until those are submitted there will be no postdoc inquiries sent out. His appointment in his advisor’s lab is official through next June, though of course we want to move on before then. I’d absolutely report irregular income on a PF blog! This month I have freelance work to focus on and continuing to support my partner’s job hunt. I want to do it to keep me motivated to put in the hours, but Kyle doesn’t like directly revealing our income. However this would only be a small part of it. Are you supporting it financially, domestically, emotionally…? I’m impressed with the breadth of your goals–awesome! I look forward to reading your progress reports and updates. Enjoy your time “off”–though sounds like you’ll be busy as ever! The new sites won’t be blogs. My plan is to put up all the content and do the promoting during my funemployment and only have minimal maintenance after that. No twice-weekly posting like on EPF! That’s awesome that you are writing a book! I would love to hear more about it. Are you going for traditional publishing or self-publishing? I’m planning to write two short books on PF this fall but just self-publish. Congrats!! You’ve accomplished so much already. I’m looking forward to reading about where funemployment takes you! Thanks so much for your support and ME TOO!! I can already tell there are so many exciting and amazing things waiting for you during this time! These are awesome goals. Good luck with everything, especially the freelance/internship and fellowship! They all sound like great opportunities. Thank you! I’d be very pleased if I were able to complete two of those three opportunities. Please comment on this series again; you are so encouraging! These are awesome goals – and I especially like the one about buying 2 domains! When I first started this site I had no idea what I was doing. However, now that I know how to do this stuff, I’ve been toying with the idea as well! I would love to hear more about how you balance all of your sites (as far as workload) in a future post! I’ll write about it as we figure it out! It’s a bit easier for me because Kyle does ALL the back-end stuff so I can just focus on content and promotion (which is the lion’s share of the work). We have two sites right now in our “PF Suite” and want to add those two more. I hope no one has snatched up the domains yet! When they are launched, I’ll cross-promote on EPF of course. I’m hoping they will all work synergistically together. Goodluck to your funemployment! What position will you be taking in your freelance position? Funemployment will surely take you somewhere. Have fun! It’s a contract position for editing scientific journal articles, so it combines my love of science with my love of grammar! I wouldn’t be undertaking this funemployment without Kyle’s stable and sufficient income. I would be very stressed in your situation without a very high savings account to buffer the ebbs and flows of employment, which of course is very difficult to build up in the midst. I hope I don’t get so caught up in looking for a FT job when the time comes that I forget about my other goals – that’s one of the reasons for this series and why I’m calling this my funemployment instead of unemployment.